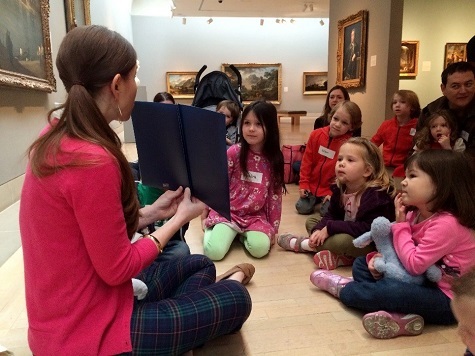 For our littlest learners, from babies to our homeschool kids, we often begin our gallery portion of the program with story time connected to the lesson’s theme. To get thinking about camelids and their importance in Inca life, we’re eyeing one of Anna Dewdney’s Llama Llama books and will then explore objects like the llama-form vessel or llama-head whistle. The focus of the lesson could also be one of the exhibition’s remarkable tunics. We would follow the journey of camelid fibers, which we have on hand for tactile exploration, from their origins on a llama to their ultimate use, being woven into a wonderful piece of clothing. Our youngest visitors will then try their hand at a weaving project in the Museum’s Art Studio. For visitors with special needs, our class might focus on jobs in Inca society. Through an object like the tunic with checkerboard pattern and stepped yoke, we can connect the idea of the Inca soldiers who wore the tunic and the weaving specialists who made it to what we know of modern occupations or memories of jobs our participants had in the past. Different art projects would be appropriate for the two groups: with our visitors with intellectual and developmental disabilities, we might choose our Inca dream job and make wearable tunics for it using materials in the Museum’s Art Studio, and for participants with Alzheimer’s, we might take our time with a weaving project. We like to have a hands-on experience all participants can enjoy. 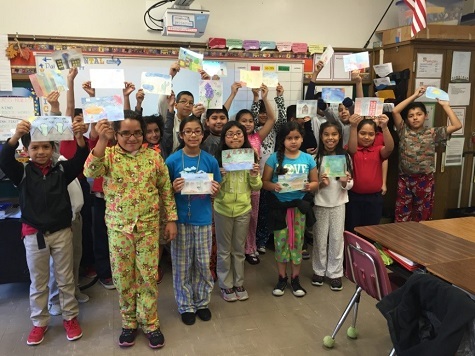 Our Go van Gogh community outreach program involves a staff member and volunteers leading programs in classrooms throughout DISD. For an Inca-based program, we would pick 3–4 works to explore around a theme such as “what we wear,” which could include items like the sleeved tunic, poncho with central medallion and double-headed-birds, or four-cornered hat. For a related art project, the students may design their own tunics using some of the geometric patterns or animal imagery we discussed. We always have amazing works of creativity come out of our Go van Gogh groups! Most teachers who sign up for school tours want their students to see as much as possible, so our wonderful docents choose highlights from all over the DMA’s expansive collection. Inca might only be one stop on a tour of five or six destinations in the Museum. 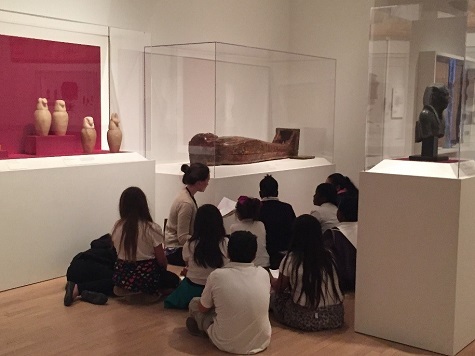 Docents typically let the interests of the students lead the discussion: are they drawn to textiles or ceramics, ideas of Inca soldiers or animal imagery? Whichever it is, docents would be sure to show contextual images such as a map of the Tahuantinsuyu empire or an illustration of a ruler wearing a tunic. Though the stop is brief, the goal is to teach the students a little bit about another culture, while whetting their appetite so they return for more! Make sure you take the opportunity to explore Inca: Conquests of the Andes/Los Incas y las conquistas de los Andes before it closes in November. In the meantime, the FAST team will be counting the days until we can explore the exhibition with our many audiences! 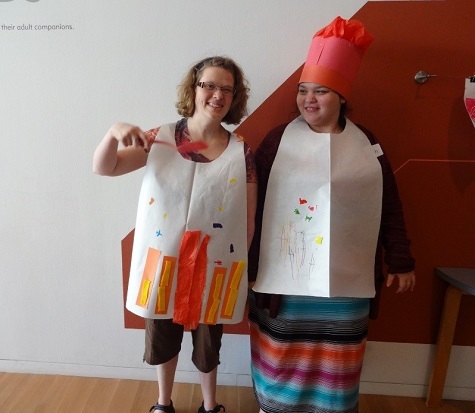 Liz Bola is the McDermott Graduate Education Intern for Gallery and Community Teaching and Jennifer Sheppard is the McDermott Education Intern for Family and Access Teaching at the DMA.